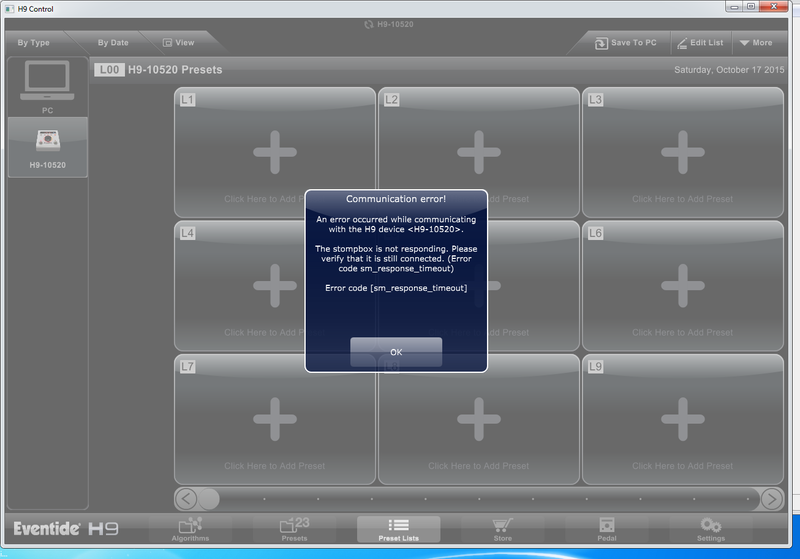 Every time I try to load the presets from my H9 in the "Presets List" view I get a "Communication error!" message. See the attached image. If I set the CLOCK OUT value to OFF within the H9 unit, then H9 Control loads perfectly fine. Another strange behavior I notice when the CLOCK OUT value is set to ON is that it takes at least 10x more time to load the H9 Control (when the "Device connected!" popup message appears). Sorry - this is Windows problem for which we currently have no solution. How about a patch to trick H9 Control and have the MIDI checking disabled during the session. MIDI doesn't work alongside with USB anyways. Is something like that doable? Sorry - as far as we know the problem is with Windows. We can't do much about that... imagine how much they care. The workaround is to turn MIDIclock off when taliking to Windows. In most cases, this will be annoying, but not stop you from doing anything.